Causing people to squirm since ancient rome, Nick Snelling traces the hypodermic needle’s history. Whether it’s an anaesthetic, blood test, insulin, vitamin shot or vaccination, at a base human level something feels instinctively wrong about having a long thin piece of metal stuck deep into your flesh. And yet, in allowing physicians to administer medicine directly into the bloodstream, the hypodermic needle has been one of the most important inventions of medical science. Our resident health humourist Nick Snelling sets out to uncover which sadistic sawbones we have to thank for the idea. Typically, it was the Romans. The word ‘syringe’ is derived from Greek mythology. Chased to the edge of a river by the god Pan, a rather chaste nymph by the name of Syrinx magically disguised herself as water reeds. Determined, Pan chopped the hollow reeds off and blew into them to create a musical whistling sound, thereby fashioning the first of his fabled pipes. Taking that concept of ‘hollow tubes’, and having observed how snakes could transmit venom, the practice of administering ointments and unctions via simple piston syringes is originally described in the writings of the first-century Roman scholar Aulus Cornelius Celsus and the equally famous Greek surgeon Galen. It’s unclear if the Egyptian surgeon Ammar bin Ali al-Mawsili was a fan of either of their scribblings, but 800 years later he employed a hollow glass tube and simple suction power to remove cataracts from his patients’ eyes – a technique copied up until the 13th century, but only to extract blood, fluid or poison, not to inject anything. Then, in 1650, while experimenting with hydrodynamics, the legendary French polymath Blaise Pascal invented the first modern syringe. His device exemplified the law of physics that became known as Pascal’s Law, which proposes “when there is an increase in pressure at any point in a confined fluid, there is an equal increase at every other point in the container.” But it wasn’t until six years later that a fellow Renaissance man, the English architect Sir Christopher Wren took Pascal’s concept and made the first intravenous experiment. Combining hollow goose quills, pig bladders, a kennel of stray dogs and enough opium to fell a herd of elephants, Wren started injecting the hapless mutts with the ‘milk of the poppy’. By the mid-1660s, thinking this seemed like a great idea, two German doctors, Johann Daniel Major and Johann Sigismund Elsholtz, decided to try their hand at squirting various stuff into human subjects. Things didn’t end well, and people died. Consequently, injections fell out of medical favour for 200 years. Enter the Irish doctor Francis Rynd in 1844. Constructing the first-ever hollow steel needle, he used it to inject medicine subcutaneously and then bragged about it in an issue of the Dublin Medical Press. Then, in 1853, depending on who you believe, it was either a Frenchman or a Scot who invented the first real hypodermic needle. The French physician Charles Pravaz adapted Rynd’s needle to administer a coagulant in order to stem bleeding in a sheep by using a system of measuring screws. However, it was the Scottish surgeon Alexander Wood who first combined a hollow steel needle with a proper syringe to inject morphine into a human. Thus, Wood is usually credited with the invention. Over the following century, the technology was refined and intravenous injections became commonplace – whether in the administering of pain relief, penicillin, insulin, immunisation and blood transfusions, needles became a staple of medicine. By 1946, the Chance Brothers’ Birmingham glassworks factory began mass-producing the first all-glass syringe with interchangeable parts. Then, a decade later, after sterilisation issues in re-used glass syringes had plagued the industry for years, a Kiwi inventor called Colin Murdoch applied for a patent of a disposable plastic syringe. 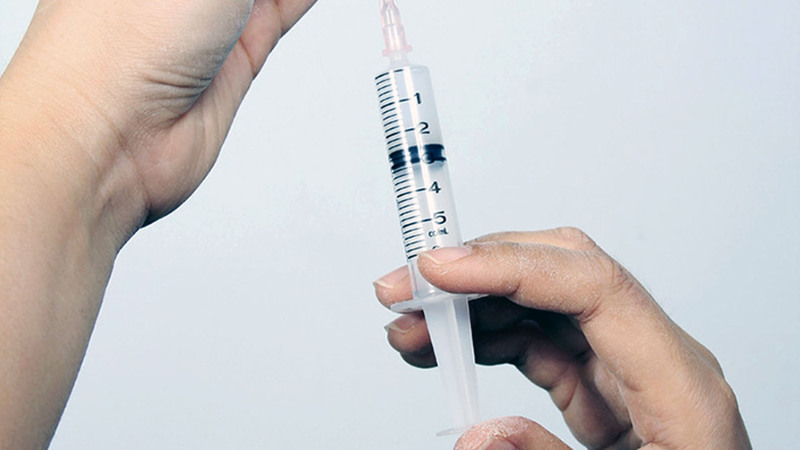 Several patents followed, and the disposable syringe is now widespread. So, is there a future beyond wincing every time the doc jabs you with a needle? Turns out there is. In 2013, an American chemical engineer called Mark Prausnitz proposed his prototype Microneedle. Like a nicotine patch, it’s made of 400 silicon-based microscopic needles, each so skinny they can deliver any medication through the skin without triggering pain nerve cells. So far, the tests on mice have worked without a single one squeaking “Ouch!”, so with any luck they’ll be at GP clinics soon.